There was a TV programme featuring Nigella Lawson spooning industrial quantities of butter into some concoction or other. She admitted that it possibly wasn’t the most healthy of dishes but it was OK because “it’s Christmas!”. Yes, this is the silly season where anything goes and everyone has the right to do outrageous things – a licence to let it all out and have fun! 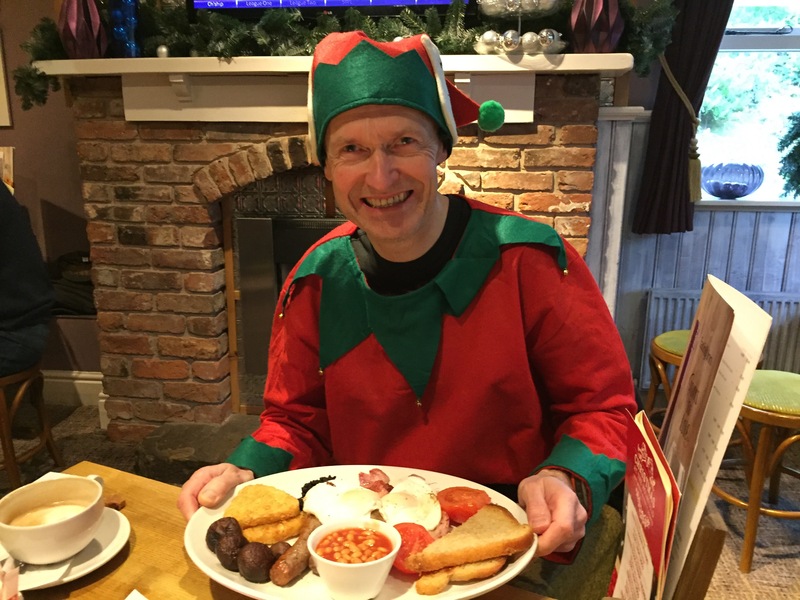 Fun for us this morning meant turning out at Wakefield Thornes parkrun with the running club dressed as elves, turkeys and even Christmas trees and then going for breakfast at the Holmfield Arms. Helen and I ran together which finished off my 100 miles in December before Christmas and for Helen, it was a course PB, so yay us! And finally, you could have fed a family of 4 with my breakfast but it was delicious! Tomorrow is Christmas Day and we will be celebrating together with our friends at Church, we won’t be eating and drinking too much excess tomorrow because we are looking forward to the Chevin Chase on Boxing Day. Last year it was floods, this year it looks like gales!